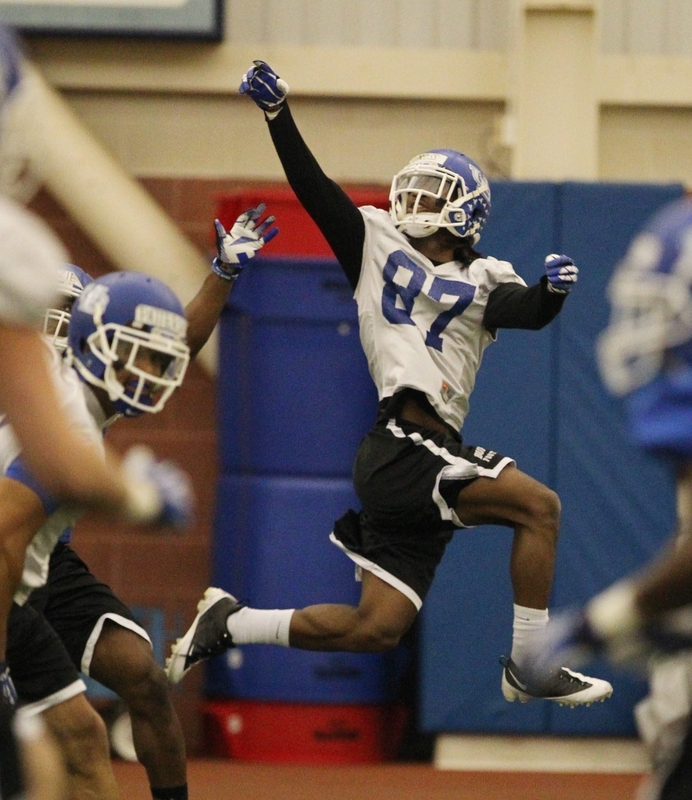 UB wide receiver Boise Ross extends to pull in a pass during the opening day of spring practice. University at Buffalo junior quarterback Joe Licata played all of last season with a torn hip labrum and a bone impingement he confirmed on Wednesday. The Williamsville South product who started all 13 games in 2013, said he suffered the injury during training camp last summer in early August. Licata will be limited for spring practice which started Wednesday at the Buffalo Bills Fieldhouse and will miss the annual Blue/White Game on April 19. Licata had surgery on Jan. 7. A month after the injury, UB’s trainers realized it wasn’t a hip flexor but a hip labrum injury. Doctors confirmed the diagnosis after the Bulls bowl game loss to San Diego State, and Licata underwent surgery. UB coach Jeff Quinn said he isn’t worried about Licata missing spring workouts. Licata was limited to sideline work as were fullback Boomer Brock and right guard Dillon Guy, a pair of seniors, sophomore offensive lineman Dan Collura and defensive linemen Zach Smekal and tailback Joe Schillace, who are redshirt freshmen. Also, junior linebacker Nick Gilbo left practice with an apparent injury to his left knee which was wrapped heavily in ice. Junior Tony Daniel took snaps with the first unit while sophomore Collin Michael was with the second team. Licata liked what he saw from the sidelines. Early enrollees Juwan Jackson and offense lineman Matt Murphy participated in practice on Wednesday. Jackson is a 6-foot-4, 215-pound linebacker from Newark N.J., while the 6-7, 295-pound Murphy hails from London, England. Both players enrolled in January. … The Bulls are off today but will resume practice on Friday at UB Stadium.